Jackie Laux wrote: Hi there. My name is Jackie. I am a Volunteer at a shelter in San Diego. There is a Dutch Shepherd here named Jader. He was brought in by a navy sailor when he had to go overseas and couldn't take his dog. Now Jader has been here for months and is not doing well. The shelter is misunderstanding his behavior and he might be euthanized soon. 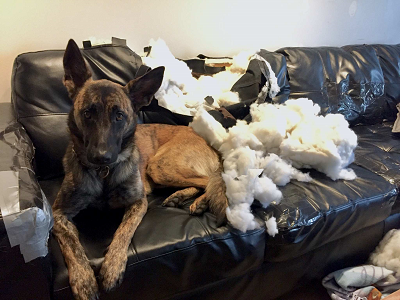 I have contacted the Dutch Shepherd rescues however they weren't very Inclined to help. He is just amazing and needs help. He is very stressed and is directing his stress toward other dogs right now. Once calm, he seems fine with other dogs. My house is already full of dogs or I would just take him and figure it out to save him. If you have any resources in helping him that would be amazing. He's super smart, can do agility, he's fast and very focused on his handler. If you have any suggestions or can point me where I should go to get help for him please let me know. Thank you. He looks like he's still a puppy. The dog is about 2 years old (75 lbs). Jackie Laux wrote: Thank you so much for even taking the time to listen. Yes I've heard conflicting evidence of him being/not being Dutch Shepherd as well. The man that had to give him up dropped him off and told the shelter he was DS. I agree his snout is a bit boxier and has some qualities that aren't DS however his demeanor is At least 90% DS if not 100%. His drive is unreal. That is part of why I am advocating for him so much. He has this amazing potential and so eager to learn and just so incredibly intelligent. He is hurting inside and confused you can totally tell. And just wants a master to give him that safety, comfort and direction. Thanks again I appreciate it so very much. Hopefully this guy finds an understanding home soon. I heard there's an adoption pending for this guy. I am waiting for confirmation. Thanks to all who shared. And, a special thanks to whoever adopted this boy.